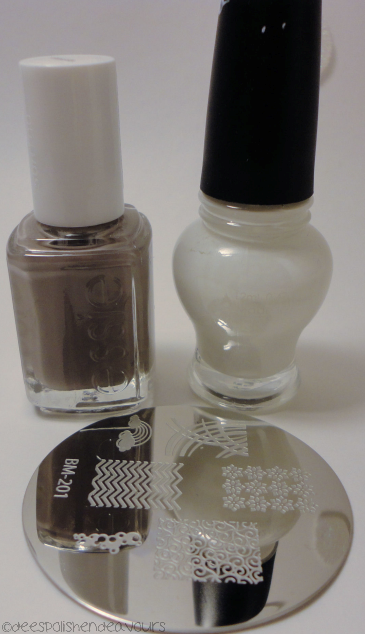 I knew the exact polish I was going to use as a base as soon as I read this days' challenge: Essie Chinchilly. A couple of weeks ago, my best friend's sister tweeted something about a perfect fall day including coffee and Chinchilly - and I remembered how important to me it was that I obtain that colour - yet I have never really WORN it. As I said before, I used Essie Chinchilly as my base, then I used Konad polish in white along with BM plate 201. 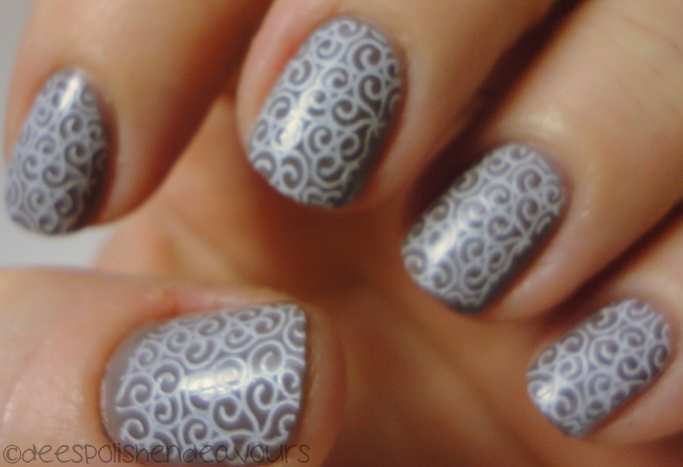 I need to become better at stamping, then this look is going to be perfection.. I quite enjoy it! I agree with Karen. It's subtle and *very* nice. Thank you all! It actually is really quite pretty. I think it will be something I will wear again very soon. It has a nice winter-y effect!